Your windscreen wipers are not something you think about very often. However, when you are driving in heavy rain you depend on them to clear your windscreen and improve your visibility. Damaged or cracked wiper blades do not work efficiently and can scratch the glass on your windscreen. It is important that you check your wiper blades regularly and replace them replace your wiper blades every 6 months or 6,000 miles to ensure that you always have a clear view of the road. The weather conditions can also plays a critical role in your wiper blades’ deterioration. Freezing temperatures make the rubber in your wiper blades hard and brittle, which increases their tendency to crack or tear. Hot weather warps the rubber and prevents the blade from wiping your windshield cleanly. Rubber deteriorates over time. As your blades age, they lose their flexibility and are less able to clean your windscreen efficiently. They can develop a permanent curvature, which prevents full contact with your windscreen and leaves surplus water on your windscreen. Taking care of your wipers is really quite easy. Periodically, take a wet towel and run it along the edge of the blade. This will remove, dust, dirt, and grime that can build up over time. Washing it away will allow your wipers to work more efficiently and last longer. Most motorists have had the experience of turning on our wipers only to discover that part of the rubber is peeling away. You might hear a screeching sound as the damage parts drag across your windscreen. When this happens, you may well be damaging your windscreen. This is why it is so important to regularly inspect your wipers for damage and you should look to replace them at regular intervals. Good visibility is vital to safe driving. Living in the UK you need to be ready for both rain and snow. Take the time to check your wiper blades now it only takes a few minutes and replace them if necessary. Alternatively call into a garage such as A1 Clutches who will be happy to do this for you. It is one of the easiest and most affordable ways that you can improve the safety of your vehicle. Today’s windscreens are more sloped than ever before for improved aerodynamics. However a modern windscreen with a lot of glass area directs more wind against your wipers, which can force the blades away from the glass at high speeds unless the wiper system is designed to resist lift. Most modern wiper blades have an aerodynamic, low-profile structure and a heavy gauge steel to help in strong winds. This is important to keep the wiper blade in tight contact with the windscreen and provide a much better squeegee effect. 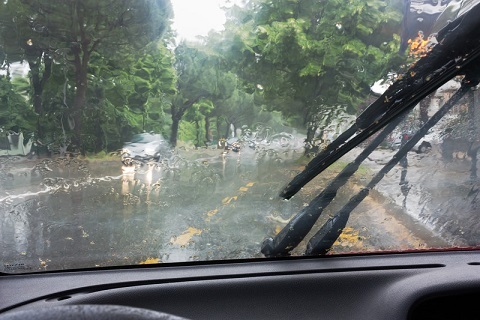 Many modern wiper blades incorporate a balance-beam design with a multi point suspension system to eliminate smearing and streaking in both directions. The more claws a blade has, the broader the area over which the pressure of the wiper arm is spread. More claws also provide increased flexibility so the blade can more easily follow the curvature of a large, sloping windscreen for full side-to-side contact. Most wiper blades are made of natural rubber, but some of the newer performance blades have a composite structure that combines a soft, pliable rubber on the squeegee surface for good wiping characteristics with a firm rubber in the blade body for improved support and durability. Look out for wiper blades that are manufactured using a unique synthetic compound that provides superior performance in all weather conditions. This entry was posted in Blog on May 23, 2016 by admin.